South Melbourne is an inner suburb of Melbourne, Australia, 2 km south of Melbourne's Central Business District (CBD). It is in the local government area of the City of Port Phillip. At the 2011 Census, South Melbourne had a population of 9,317. Historically known as Emerald Hill, it was one of the first of Melbourne's suburbs to adopt full municipal status and is one of Melbourne's oldest suburban areas, notable for its well preserved Victorian era streetscapes. Before European settlement, the area now called South Melbourne featured a single hill (where the Town Hall now stands) surrounded by swamps. The Hill was a traditional social and ceremonial meeting place for Aboriginal tribes. The area was first settled by Europeans in the 1840s and became known as Emerald Hill. During the Victorian Gold Rush of 1851 a tent city, known as Canvas Town was established. The area soon became a massive slum, home to tens of thousands of migrants from around the world. Land sales at Emerald Hill began in 1852 and independence from Melbourne was granted, when Emerald Hill was proclaimed a borough on 26 May 1855. Many of the residents of Canvas Town moved to prefabricated cottages in suburbs like Collingwood and South Melbourne and some of these early homes remain in South Melbourne's Coventry Street. The new municipality developed rapidly and by 1872 Emerald Hill was proclaimed a town. During the late 1870s, South Melbourne became a favoured place of residents for Melbourne's middle class, with fashionable terraced housing becoming the norm, including some English style squares, the best example of which was St Vincent Gardens. The South Melbourne Town Hall was built between 1879 and 1880 and designed in suitable grandeur to evoke the city's booming status, establishing a civic heart at Bank Street, bordered by Clarendon, Park, Cecil and Dorcas Streets. In 1883 Emerald Hill became a city, changing its official name to South Melbourne. South Melbourne experienced a decline in the 1950s as Melbourne sprawled outwards. Like many other Melbourne inner city suburbs, during the 1960s, the Housing Commission of Victoria stepped in and erected several high-rise public housing towers, the tallest and largest of which, Park Towers (c.1969) is in South Melbourne. 'Emerald Hill Court' is the other housing commission building located in South Melbourne (c.1962). The result was an injection of migrants adding to the multicultural flavour of the area. In the 1980s, South Melbourne experienced one of Melbourne's biggest waves of gentrification. Many of the terrace homes were restored and renovated and a new middle class moved in. As a result of the development of Southbank in the 1990s, Clarendon Street has become one of the highest rental yielding commercial streets in the entire city of Melbourne, attracting many of the residents from the apartment buildings to shop. Recently, there has been some new developments within South Melbourne and at the Southbank end of Clarendon Street, including Australia's largest hotel. South Melbourne is served by tram routes 1, 12, 58, and 96. Route 96 runs along the former St Kilda railway line, which was converted to light rail in 1987. In 2006 there were strong calls by a joint council project and the Inner Melbourne Action Group to provide an inner south tram link between the City of Port Phillip and the City of Stonnington, by connecting route 112 with route 8 via Park Street. This would have required less than 100 metres of track to be laid along the Park Street gap to create the new route. The main commercial district is centred on Clarendon Street and side streets, including an area around the South Melbourne Market, with many retailers, cafes, eateries, art galleries and more. Like the Melbourne CBD, there are many small laneways in South Melbourne, most of them cobbled in bluestone. South Melbourne's predominant housing is terraced or semi-detached Victorian. Park Towers is a notable example of Housing Commission of Victoria hi-rise public housing. There are a number of such towers in parts of South Melbourne, built since the 1960s. In recent years, South Melbourne has seen an increase in population density, due to apartment development in nearby Southbank, where development has spilled over from the Melbourne CBD. To the east, towards the St Kilda Road complex, are many high rise office buildings. The town hall precinct is home to some of Melbourne's best examples of Victorian architecture. See Yup Temple is a Chinese temple, built by the See Yup Society in 1856, dating back to the gold rush era. South Melbourne features television production studios owned by the Seven Network and Global Television in the south of the suburb. This was formerly the Melbourne studios of the Seven Network prior to them moving to the Melbourne Docklands's Digital Broadcast Centre. Several Channel Seven shows like Deal or No Deal, Dancing with the Stars and It Takes Two were filmed at the South Melbourne location while News and Today Tonight are filmed at Docklands. South Melbourne FC is regarded as one of Australia's most successful soccer clubs, with four national titles to their name. They currently play in the Victorian Premier League at Lakeside Stadium, a rectangular stadium built on Lake Oval, the former home ground of the South Melbourne Swans. Historically, they have been known as South Melbourne Hellas, a tribute to the migrant Greek founders of the club and traditionally played at Middle Park. It was once home to the South Melbourne Swans team, which played in the Victorian Football League (VFL), which played out of the Lake Oval (now Lakeside Stadium) in nearby Albert Park, before relocating to Sydney in 1982 in a radical move, which eventually spawned the national Australian Football League. More recently a new athletics track and field facility replaced the earlier updated soccer ground however soccer is still present in the centre of the track. ^ Australian Bureau of Statistics (27 June 2017). "South Melbourne (State Suburb)". 2016 Census QuickStats. Retrieved 12 April 2018. 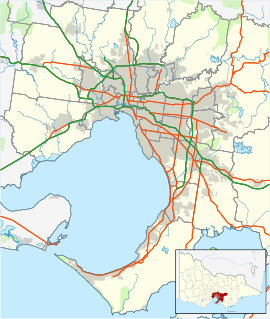 Wikimedia Commons has media related to South Melbourne, Victoria. This page was last edited on 18 April 2019, at 03:37 (UTC).